A less fantastical, angstier book than Charlotte Doyle, this Avi y/a novel concerns two kids with different ways of disguising the truth about their family lives. 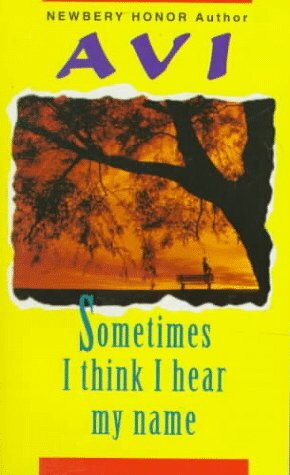 It was a very powerful book for me in jr. high. Argh! This book is so real, so painful, so sad, and ultimately beautiful. As I read it, I thought it was just a story of a 13-year-old boy who missed his parents. In the end it turned out to be a piece of art about human emotion and frailty. GENERAL FICTION CATEGORYConrad lives in St. Louis with his Aunt Lu and Uncle Carl. His parents live in New York. After the divorce, it was decided this was best for everyone. And it is, until Conrad realizes that his parents no longer seem to know him. He hasn't seen them in almost a year, and the presents they sent for Christmas were things he didn't care about. When his aunt and uncle tell him he's going to England for vacation instead of New York to see his parents, he becomes desperate to find a way to change the plan. As he is picking up his plane ticket, by chance he meets Nancy, a girl with a tiny green butterfly tattoo on her hand, who hardly speaks. Nancy lives in St. Louis. Her parents live in New York. When Conrad finds himself in New York, he and Nancy find his parents. As he becomes closer to Nancy, he realizes the truth about his parents and comes to understand his aunt and his uncle too. When I was twelve, I stole this book from my public library. I just couldn't bear to give it back. One of Avi's earlier works, it's written in deceptively simple language, the characters are believable, and the pages almost turn themselves. This book was a read aloud in fifth grade, and at the time, I thought it was one of the best books I had read the whole year. I could picture the whole story really clearly in my mind, almost as if it was a TV show I was watching. I pictured what the main character (Conrad) looked like, and his hometown. I was actually sort of sad when we finished the book, because I had really enjoyed reading (well, more like listening) to it. The characters were very realistic and I could relate to how they felt in many ways. The overall plot was very strong, and again, very realistic and possible. I read this when I was 11, so I would reccommend this book for middle schoolers.It's basically a story about a boy and a girl who both have many complicated family problems. They get to know each other and help each other face these problems. I know this review is lacking...but it was a long time ago, and if I mention anything else, it would probably ruin the book. By the way, the ending is AMAZING. It was okay. The thing is, I really just didn't like the characters. Not the writing, the characters themselves. I didn't relate to them, I thought they were unlikable... made it hard to like or appreciate their story. I think this book had a very good plot idea. However, the book kind of lost me in the middle. The whole thing about his parents being divorsed did not affect the book as much as I would have liked it to.It was an ok book. What a strange book. Deals with broken marriages that break apart and that insist on staying together, and the damage that comes to the children in those marriages. I read this book based on title alone when I was younger. I only remember now that it was sort of sad. This is a fantastic small book! Stick with it until the very end and it will be very worth it.